Some information on the most famous art cities and tourist areas in Tuscany. A town of health and welness, Montecatini has always been renowned for the quality of its thermal waters. The baths are, therefore, an unforgettable stop in getting to know the city. In addition to the possibility of personally experiencing the benefits of the waters and the mud baths, the architectural complex offers an important and striking cross-section of the Art Nouveau style that characterises Montecatini Terme. 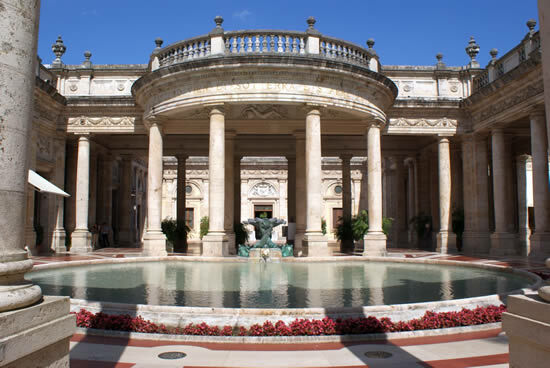 Various baths may be found along the Art Nouveau itinerary: Grocco, Tamerici, the nineteenth-century Terme Torretta and the Excelsior establishment. However, Tettuccio stands out of all the thermal resorts as the genuine and characteristic symbol of the town, built in the grand-ducal era and renovated in 1925 by architect Giovannozzi, who aspired to make it a true bath citadel surrounded by greenery. A stroll along Viale Verdi and in the adjacent streets unveils other Art Nouveau jewels: the portico of the Caffè Gambrinus with its shops and art galleries, the City Hall built from the old grand-ducal stables; the Cinema Excelsior, the Kursaal and the Teatro Politeama built in 1926. The cradle of Art in the world: the artistic and architectural treasures in Florence are countless and priceless. In Piazza Santa Maria del Fiore you will find the famous Duomo (Santa Maria del Fiore cathedral), with Giotto’s Bell Tower and the Baptistery. 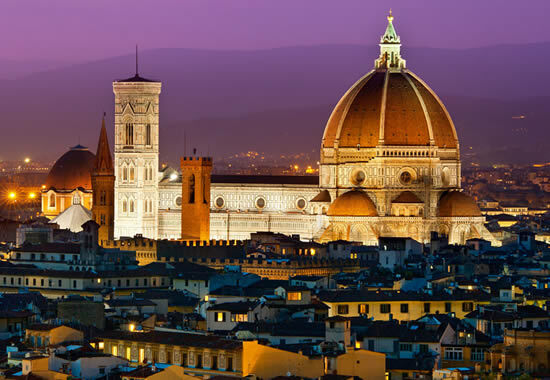 Not far from Piazza della Signoria you can reachPalazzo Vecchio, Piazza Santa Croce, Ponte Vecchio on the Arno river, the Uffizi Museum, Piazza Pitti with Palazzo Pitti and the Boboli Gardens, the Accademia Gallery with Michelangelo’s David. Florence is also famous for its gastronomy. The Tuscan cuisine can be tasted in famous restaurants and small taverns throughout the city, drinking an excellent Chianti wine, produced in the nearby countryside. With its height of 56 meters, the Leaning Tower is the symbol of the city. 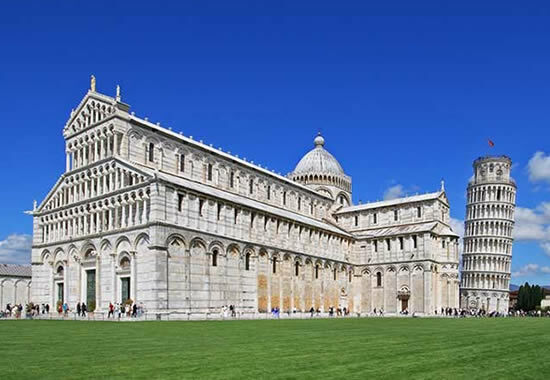 It stands on the green lawn of Piazza dei Miracoli, and welcomes tourists in a unique architectural setting. The Cathedral in the roman style and the Baptistery complete the landscape. Pisa is an important university town. Here, in addition to the University are located the Normal School and the Research National Council. The city is crossed by the River Arno (which flows through Florence before reaching Pisa) and the area of the Arno River is fascinating both for tourists and Pisa inhabitants. In addition to the Piazza dei Miracoli other churces and palaces are worth a visit: the churches of San Francesco, San Nicola, San Michele and San Frediano, and a number of famous buildings, such as the Praetorian Palace, Palazzo Agostini, the Archbishop’s Palace, Palazzo Reale and Palazzo Medici. “A city of art and history, famous in the whole world, where life is good.” This is the definition that a Lucca citizen would give to his city. 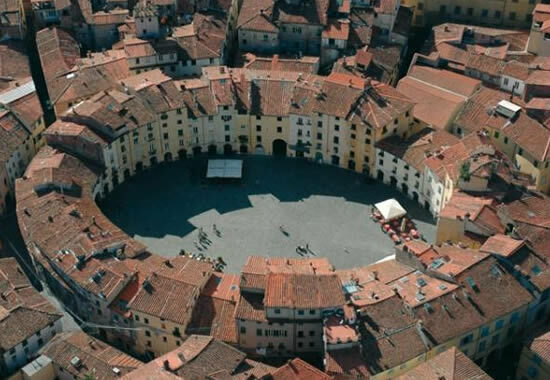 Although Lucca is almost as famous as Florence, the historical centre has remained a place where living is a pleasure, and it is not just a place for tourist. The city of Lucca is defended by imposing walls dating back to 1600 – 1700, over 4 km long, where today it is nice to go for long walks or bycicle rides. What can you see in Lucca? Piazza San Michele (or “Square of chains”) with the roman church of San Michele in Foro, Piazza Anfiteatro, unique in its kind, Via Fillungo, where you can still find the old shops old “workshops”, Piazza San Martino, Piazza Napoleone and the famous Torre Guinigi, with famous tree sticking out the top. Cuisine in Lucca is a must. All dishes of the old Lucca traditional gastronomy can satisfy the taste of any national or international tourist. 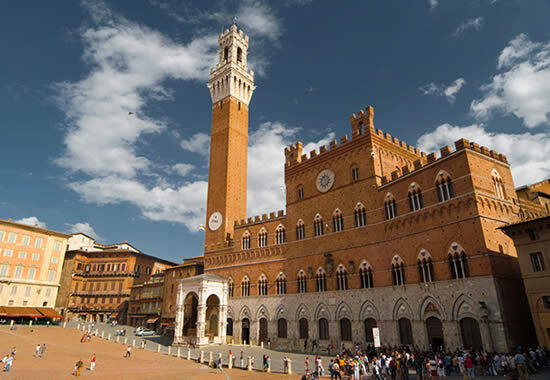 In the heart of Tuscany, Siena owes its fame either for Art and the famous Palio, a historical horse race of medieval origin where – twice a year, on July 2 and August 16 – 10 riders on horseback will compete three laps of Piazza del Campo. Piazza del Campo is the symbol of the city, where on one side the Public Palace is located, built of brick and marble, with the famous Torre del Mangia. The square has a shape which reminds us of a seashell. Of particular interest is the Cathedral of Santa Maria Assunta in Piazza del Duomo, in Roman-Gothic style, and the Baptistery of San Giovanni, in San Giovanni square. After much art, architecture and history, it is worth spending a day at the beach, on the Versilia sea-shore. Ideally, it covers the area from the towns of Forte dei Marmi (North) and Torre del Lago (South), passing through Marina di Pietrasanta, Lido di Camaiore and Viareggio. Along this strip of sea, made ​​famous in Italy and abroad during the Belle Epoque and the “roaring years” (1960/70) you can find towns suitable either for luxury tourism (Forte dei Marmi) popular tourism. The coastline almost entirely covered by bathhouses, an ideal place for a summer vacation. 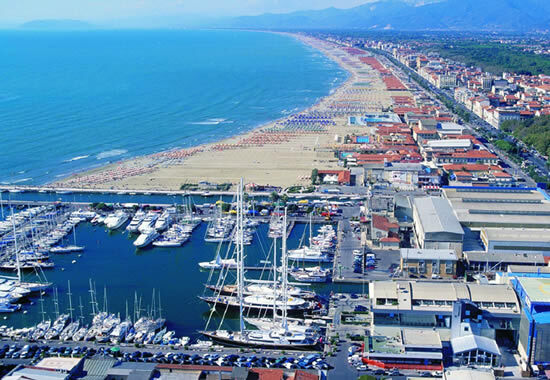 In Viareggio we can visit the port (both tourist and commercial), the famous “Promenade”, with shops, restaurants, pizzerias and ice cream shops, and the Pineta (pine trees wood), a large green area within walking distance from the seashore. Forte dei Marmi is the ideal location for shopping. In the center of this town you will find boutiques of the most important brands in the fashion world. And if you are looking for a nightlife, there is plenty of choice anywhere in Versilia. The Apuan Alps are a mountain range in Tuscany, in the area among Lunigiana, Versilia, and the Piana di Lucca (Garfagnana). The highest peak is Mount Pisanino, 1946 meters high. These mountains are a paradise for of trekking and hiking enthusiasts. In this vast territory, the Italian Alpine Club has produced many trails of varying difficulty, either for experienced and non-experienced hiker, who simply love easy walks outdoors. 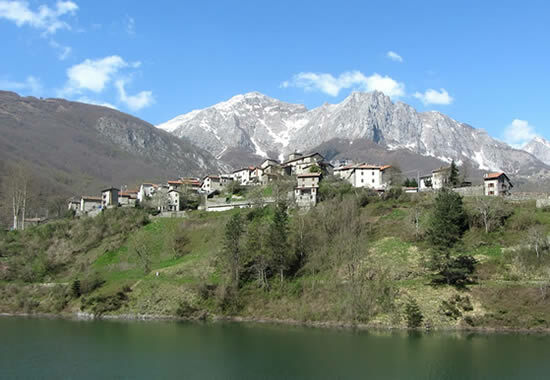 In the area near Carrara are located the famous marble quarries, where Carrara marble, is extracted, famous for being used in the most famous architectural works in the past and present world. In the southern side of the Ligurian coast, on the border with Tuscany, five villages overlooking the sea each year attract tourists from all over the world. 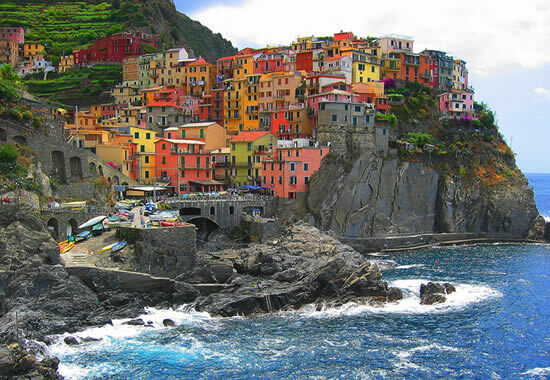 These villages are Monte Rosso, Manarola, Vernazza, Manarola and Corniglia. Put them toghether and you obtain the Cinque Terre. In anunspoilt landscape – the sea on one side and the mountains on the other one – the Cinque Terre offer a breathtaking landscape, and are an ideal holiday destination throughout the year, thanks to the mild weather even in winter. A special attraction of Cinque Terre is the “Via dell’Amore” (path of love), a section of trail overlooking the sea connecting Riomaggiore to Manarola. In summertime, thanks to the arrival of tourists, the population of the Cinque Terre increases up to ten times. In the world Chianti is a synonym of wine. 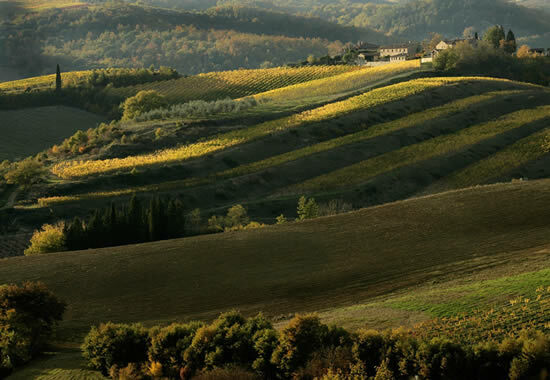 The name Chianti is attributed to a hilly area – the Hills of Chianti – which covers about 20 km between the provinces of Florence, Arezzo and Siena, in the heart of Tuscany. In this area the most famous activity is definitely the production of fine wines, exported all over the world, am unmistakable “Made in Italy”symbol. The most famous villages in the Chianti area are: Radda, Gaiole in Chianti, Greve in Chianti, Castelnuovo Berardenga, Castellina in Chianti, Madonna a Brolio, Monteriggioni. Easily accessible from any part of Tuscany, Chianti is a destination for traditional and food and wine tourism. It is so famous in the world that the term “Chiantishire” has been created in England. The gentle hills of Chianti also offers remarkable opportunities for hiking and trekking, with trails of various levels.